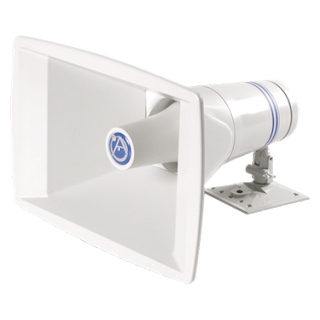 The What: Atlas Sound's APX40TN is a 40 watt constant-directivity paging loudspeaker for use in public address or paging applications.The What Else: This constant-directivity loudspeaker offers exact positioning flexibility with a simple twist of the wrist. The APX loudspeaker is well-suited for indoor applications including commercial, light industrial, and large retail/distribution applications where clear and pleasant indoor paging/communications and security are required. The speaker is also appropriate for installation in outdoor retail, commercial, recreational, and public use areas where dependable weatherproof performance is needed for communications and security.